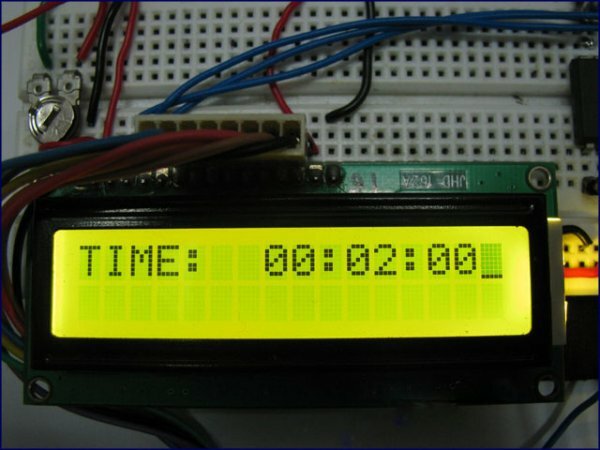 A Digital Clock can be made easily by using PIC Microcontroller, DS1307 and a 16*2 LCD. I have already posted about Interfacing DS1307 RTC with PIC Microcontroller. The DS1307 RTC can work either in 24-hour mode or 12-hour mode with AM/PM indicator. It automatically adjusts for months fewer than 31 days including leap year compensation up to year 2100. DS1307 comes with built-in power sensing circuit which senses power failures and automatically switches to back up supply. We can provide a 3V CMOS Battery for that. Communication between PIC Microcontroller and DS1307 takes place through I²C Bus. Note: VDD , VSS of the Pic Microcontroller and VCC , GND of DS1307 are not shown in the circuit diagram. VDD, VCC should be connected to +5V and VSS, GND to OV as marked in the circuit diagram. To simulate this project in Proteus you may need to connect I2C Debugger. SCL and SDA of I2C Debugger should be connected in parallel to SCL and SDA of DS1307. I2C Debugger can be found where CRO can be found in Proteus. You can download the MikroC Source Code and Proteus Files etc at the end of this article. Here I explains the Source Code and different functions used in it. DS1307 RTC is fully Binary Coded Decimal (BCD) clock/calender. So the data read from DS1307 should be converted to required format according to our needs and data to be written to DS1307 should be in BCD format. Library for Interfacing LCD With PIC Microcontroller of MikroC needs Character or String Data. So data to be displayed in the LCD Screen should be converted to Character. 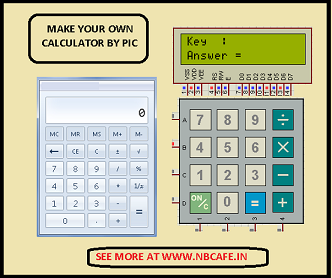 Addition and Subtraction cannot be directly applied on BCD. Here I am first convert BCD to Binary. Then addition and subtraction can be simply applied on Binary. Then the Binary is converted back to BCD. 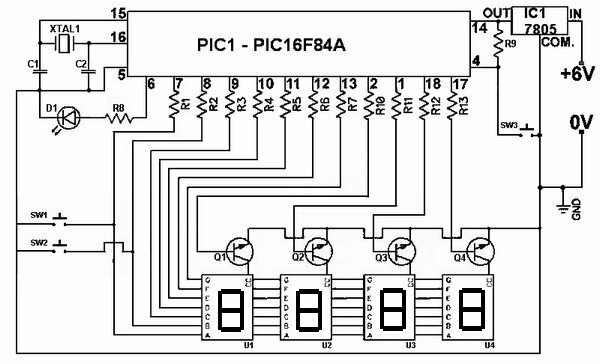 Functions that are used for reading and writing data from DS1307 are explained in the article Interfacing DS1307 with PIC Microcontroller please refer it. BCD2UpperCh() and BCD2LowerCh() are the two functions used to convert BCD to Character. Hour, Minute, Second, Date, Month and Year data are stored in DS1307 in separate 8-bit registers in BCD format. We read the data of these registers to access time/date. BCD2UpperCh() converts most significant 4 bits to corresponding character and BCD2LowerCh() converts least significant 4 bits to corresponding character. The BCD2Binary() converts the BCD data read from the RTC to corresponding Binary for addition or subtraction and Binary2BCD converts the Binary back to BCD. Bit 6 of Hour register is defined as the 24-hour or 12-hour mode selection bit. When this bit is made high, 12-hour mode is selected and Bit 5 will represent AM/PM (Logic High represents PM).